one + = nine Required Please enter the correct value. 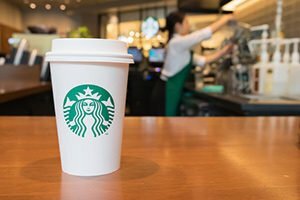 There have been rumors that Starbucks Corp. (Nasdaq: SBUX) would accept Bitcoin, but now we have concrete evidence that it's about to happen. The coffee giant is partnering with Microsoft Corp. (Nasdaq: MSFT) and the Intercontinental Exchange to launch a new company called Bakkt. The new company will allow retail consumers and institutions to buy, sell, and spend cryptocurrencies, according to CNBC. Bakkt is expected to launch by November. "As a leader in mobile pay to our more than 15 million Starbucks Rewards members, Starbucks is committed to innovation for expanding payment options for our customers," Maria Smith, vice president of payments and partnerships for Starbucks, said in a statement. One of the current knocks on cryptocurrencies is that major retailers won't accept it. As soon as Starbucks receives Bitcoin for a latte, it could be a game changer. Australia is awarding a $100,000 grant to a crypto travel startup, according to Coindesk.com. TravelbyBit sets up crypto payment platforms for merchants and allows travelers to spend their digital currencies on a designed "tourist route." There are 150 merchants using TravebyBit's payment platform, and the crypto startup is working with the Brisbane Airport. Walmart Inc. (NYSE: WMT) is getting innovative to fight off Amazon.com Inc. (Nasdaq: AMZN), and part of WMT's strategy is to use blockchain. Walmart filed a patent on Aug. 2 for the management of smart appliances using blockchain technology. According to CoinTelegraph.com, one use case described was a kiosk for receiving packages from delivery drones. Finally, Square Inc. (NYSE: SQ), a disruptor in the financial services space, just reported that it generated over $70 million in Bitcoin revenue for the first half of 2018. Revenue in Q2 from Bitcoin hit $37 million, and total revenue for the company in Q2 was $814 million.